It's official, you won't be playing Alan Wake with a mouse and keyboard. 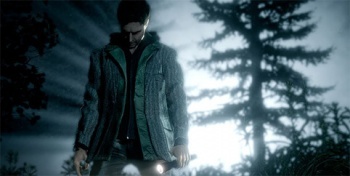 It's been a long time coming, but Remedy Entertainment's 'psychological action thriller' Alan Wake finally has a release date - May 18th - but sadly, only Xbox 360 owners are going to get to play it. Microsoft was keen to head off accusations that it was abandoning the PC, saying that the decision was all about making the game as good as it could be. "Some games are more suited for the intimacy of the PC, and others are best played from the couch in front of a larger TV screen," said a Microsoft spokesperson. "We ultimately realized that the most compelling way to experience Alan Wake was on the Xbox 360 platform, so we focused on making it an Xbox 360 exclusive." "Both Microsoft and Remedy have long histories in PC game development. This decision was about matching this specific game to the right platform," they added. It's hard not to feel a little sad - or a little angry - about this announcement, even if you have both systems. Personally, I first heard about this game in the PC gaming press all those years ago, and even though I have a 360 and can still play it, I can't help but be a little wistful about what might have been.